A Dundee aviation enthusiast, who has been flying since the age of 14, has become Scotland’s first flying graduate to land a post with the largest independent regional airline in Europe. 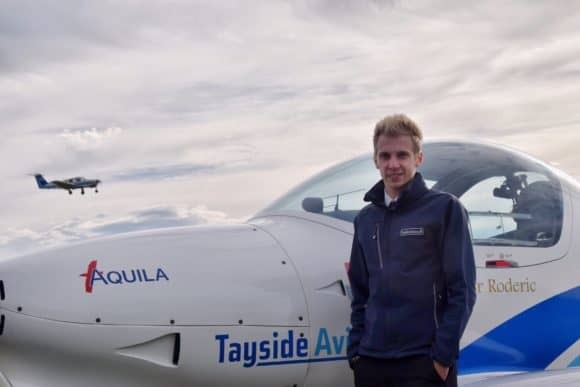 Dundee-born Gavin Ritchie (24) is one of the first batch of 53 students who will graduate from Tayside Aviation’s BSc (Hons) Professional Aviation Pilot Practice degree at Middlesex University in June 2019. Having now completed the degree, the first of its kind available in Scotland, Gavin has become the first graduate to land a pilot post. Due to the fast-track nature of the degree, Gavin could be on course to become a Captain within two years. Taking up the position of First Officer on the Dash 8 Q400 aircraft with Flybe on 1 November 2018, Gavin was two years into the University of Dundee’s Mechanical Engineering degree when he decided to switch to Tayside Aviation’s flying degree. He was already a familiar face with the award-winning family business, having been learning to fly in his own time since the age of 14, flying solo at the age of 16 and obtaining his Private Pilot’s Licence at the age of 17, the minimum national requirement. Today, Gavin bid farewell to Tayside Aviation en route to his new base of Edinburgh Airport. Having held the post of Flight Instructor since April 2017, alongside his degree work, he has surpassed over 1,000 flying hours. Gavin went on to win ‘Student of the Year’ award from the Aviation Skills Partnership, which was heavily involved in the formation of the degree in conjunction with Middlesex University back in 2015. Indeed, pursuing the pilot dream typically costs around £120K in an integrated flying school, but only £60K through Tayside Aviation’s programme. Full entry requirements for the degree course can be viewed at www.taysideaviation.com or by calling (01382) 644372. Tayside Aviation also holds monthly open days to provide information and course overviews. To register your interest, visit recruitment@taysideaviation.com.